Energy, effort, and three point shooting combine for the win. The Bulls came into Friday’s preseason game against the Milwaukee Bucks disorganized, disturbed and in disarray—you might say dislocated--from the 47-point loss in Dallas. The Bulls defeated the Bucks 114-101, but could not escape the dislocation. 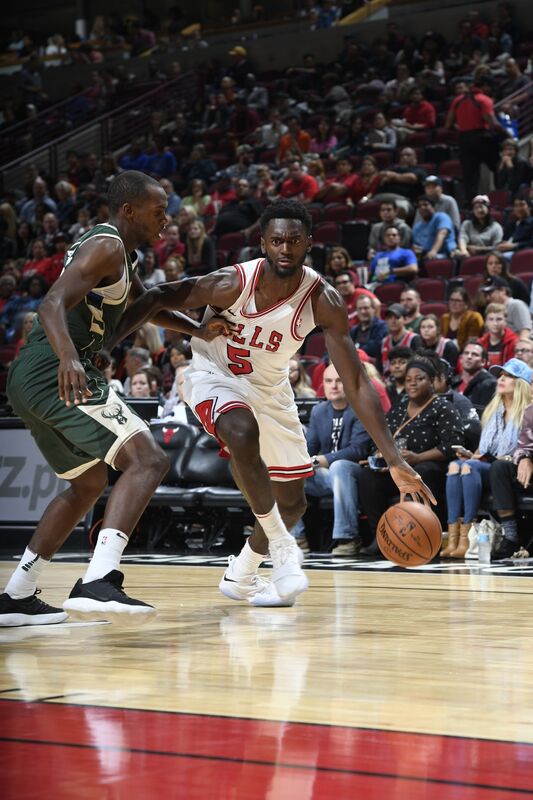 This time is was merely a finger’s worth, and in many ways it hurt more since it could mean a month sidelined for top prospect Kris Dunn, who had his best game as a Bull in the victory. "Kris was unbelievable tonight," agreed Bulls coach Fred Hoiberg. "He really went out there ball hawking on defense, getting into the paint and making plays. His shot looked really good on that three he hit from the right wing (five of seven shooting for 11 points in 16 minutes). He really looked comfortable out there. So it’s unfortunate it happened. Just have to keep his spirits high as he goes through the recovery process and hopefully get him back before too long." It was a sour patch in a night, the exhibition opener in the United Center, when the positives for the Bulls were good and plenty. This was a kid in a candy store night for the Bulls leading virtually start to finish. 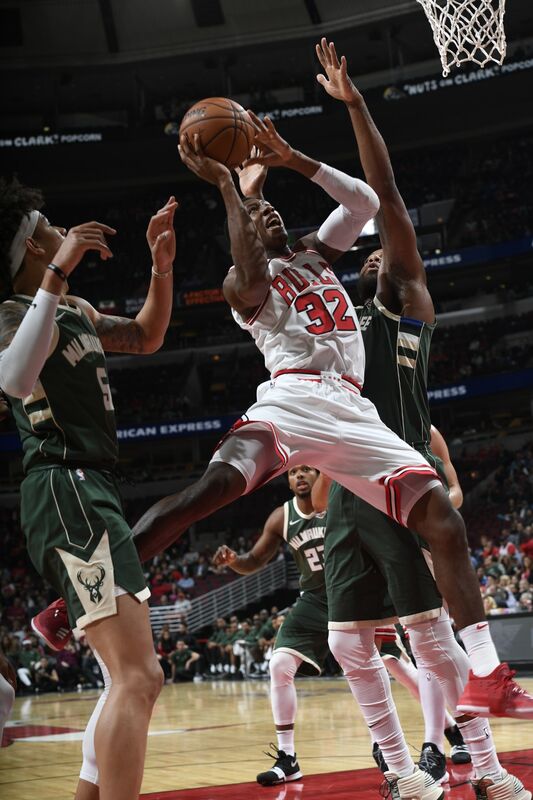 The Bulls had six players score in double figures led by Justin Holiday with 21 points and five of seven threes. Overall, the Bulls were red hot from three, making 17 of 34. 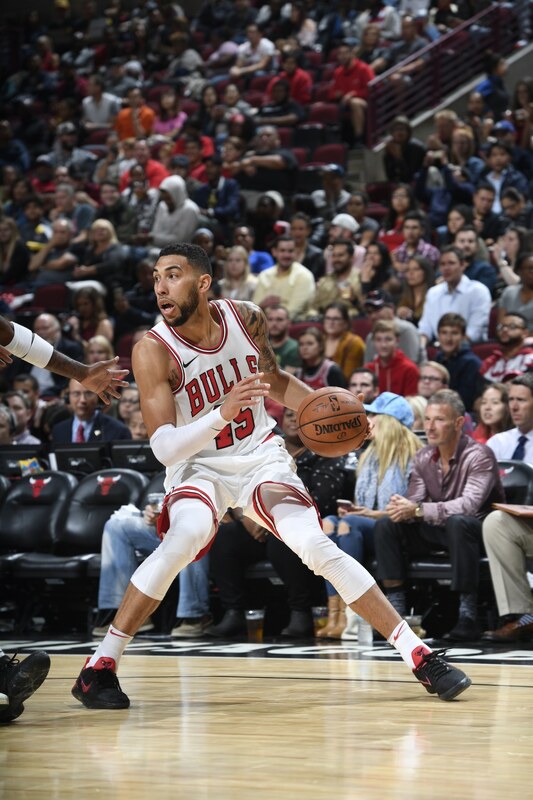 Denzel Valentine was five of six on threes and had 15 points along with Nikola Mirotic and Bobby Portis, the latter also with 10 rebounds. Pay day. "I give our guys a lot of credit for coming in with a great mentality this morning for our practice," said Hoiberg. "Everything we talked about this morning, as far as getting the ball up the floor, the pace, the ball movement. We got that back tonight and that led to some early shots. Thankfully, some of them went down and gave our guys some confidence." The Bulls moved to 2-1, though they needed a bit of a star burst after surrendering in Texas. And perhaps there is something to having this group of role players back to being unselfish with 30 assists on 43 baskets. Bucks coach Jason Kidd curiously explained the loss as the Bulls not having enough All-Star players to interest the Bucks. The sneak up on them strategy. "One of the things we have had trouble with is playing a team without an All Star," said Kidd. "We cannot play down to the level of our competition in the sense of waiting. We just need to turn it on. Tonight they got a bunch of great open threes and we were just not respecting them." Yes, your perennial champion Milwaukee Bucks. You know, the franchise that has won a first round playoff series once since 1989 and missed the playoffs seven of the last 11 seasons. Somebody wake up Tony Snell to see if he’s upset. Just kidding. Hoiberg was not joking after the embarrassing road loss, even for a preseason game. He challenged his guards by saying if they were too tired to push the ball he’d get someone else. He demanded the basketball and players actually move like in Game 1. 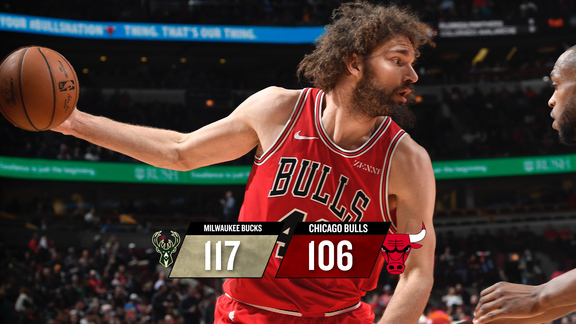 Hoiberg got the results from the start with two Holiday threes for a quick lead, the Bucks coming back and then an amazing Bulls second quarter shooting nine of 11 threes that included a 60 foot heave and miss to end the quarter. "We have a lot of guys who can shot," said Holiday. "I remember I got the ball, swung it around and every dude who touched the ball could shoot; that’s tough to play against. But it’s a great feeling to play with because it opens up for the next guy. "It says a lot (after a loss like that), especially for a young team like ours," said Holiday. "I think we showed the energy, the effort. Those are two things we’ll need, and we stayed together. We didn’t move the ball as much and as fast (in Dallas) and tonight we took that lesson, moved the ball up the floor and ended up playing a great game." The Bulls took a 60-56 halftime lead with 12 Valentine second quarter points. "I just wanted to take open shots and make the right play," said Valentine. "We’ve been big all camp on making the right play, moving the ball. Since we’re playing unselfish, the open shots came. I shot the ball confidently when I got my open looks." The Bulls still didn’t get to the free throw line much, 17 free throws to the Bucks’ 31. But so many shots went in this time. And one reason they did is they were much better with classic drive and kick actions, the Milwaukee defense sagging with the more aggressive offensive thrusts and shots that open being more comfortable. There wasn’t so much of the so called east to west, going nowhere passing from the Mavericks game. There were drives, pass outs, and then the cross court actions for the better shots. This Bulls group, though Kidd obviously won’t be giving any All-Star votes, has more deep perimeter threats than the Bulls have had in recent years with Mirotic, Holiday, Paul Zipser, Valentine and to an extent Jerian Grant and Bobby Portis. The most aggressive guy may have been free agent guard David Nwaba. He played 15 minutes, but had four free throw attempts. He challenges the basket harder with dunk attempts than anyone on the team. If he can shoot, he might be a find. G-league signee Antonio Blakeney showed his scoring, getting four quick points in his four minutes. Behind Holiday and the reliable mid range shooting of Robin Lopez, the Bulls began to pull away in the third quarter for an 89-77 lead. Then three minutes into the fourth, Dunn came running over to help on a driving dunk by Sterling Brown, who played at Proviso East High School. Dunn caught his left index finger, tearing away the skin and hooking the finger to what Valentine said was a 90-degree angle. Dunn was taken immediately to the locker room, where trainer Jeff Tanaka pushed it back in place. "I saw enough of it," said Holiday wincing. "I didn’t like seeing it; I looked away." Dislocations are common in basketball, but Hoiberg said the contributing factor was the open wound, which requires stitches. There was no fracture, but Hoiberg estimated healing would take about two weeks and then some time to get back. So it seems certain Dunn will miss the regular season opener Oct. 19 in Toronto. But there should be no issues when he returns. So Grant, who drew the start Saturday, can relax for awhile as the point guard starter, though Dunn was superior Friday. Ryan Arcidiacono, who like Blakeney has a two-way G-league contract, probably moves up to backup point guard for now. 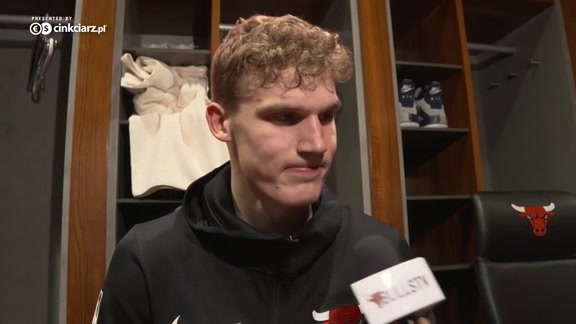 And Hoiberg indicated if there are no setbacks at practice Saturday, rookie Lauri Markkanen likely will make his debut Sunday against the Pelicans. "Things happen," said Valentine. "Next man up; just got to keep grinding."